Preheat oven to 375 degrees. Line two cookie sheets with aluminum foil. Fit your mixer with the paddle attachment and cream butter and sugars until smooth. Add egg and brandy and beat to combine. In a separate bowl, sift flour and soda together, add in increments with the mixer on low until just combined. Remove paddle and scrape down. 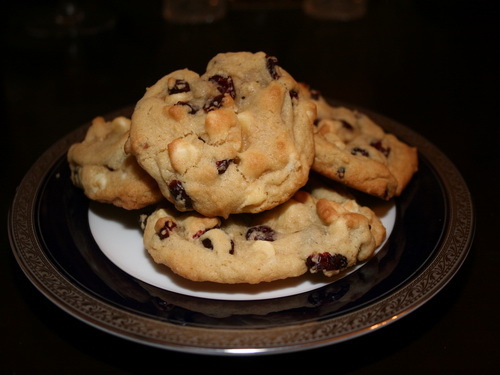 Using a spatula, mix in cranberries and white chocolate chips. Using two tablespoons, drop healing teaspoonfuls onto prepared cookie sheets. Bake for 10-12 minutes or until lightly browned. It’s okay for the cookies to look slightly undercooked when you remove them from the oven. Allow them to cool, on the foil, for 3-4 minutes, then using a spatula, transfer to a wire cooling rack and allow to cool completely (they will crisp up slightly as they cool).